The prompt for today is: describe where or what you came from. Hello again to new friends and old friends! I am so excited to be taking part in Jenni's Blogtember challenge, as I enjoyed it so much last time. I managed to blog everyday and met some lovely people too. Let the fun begin! 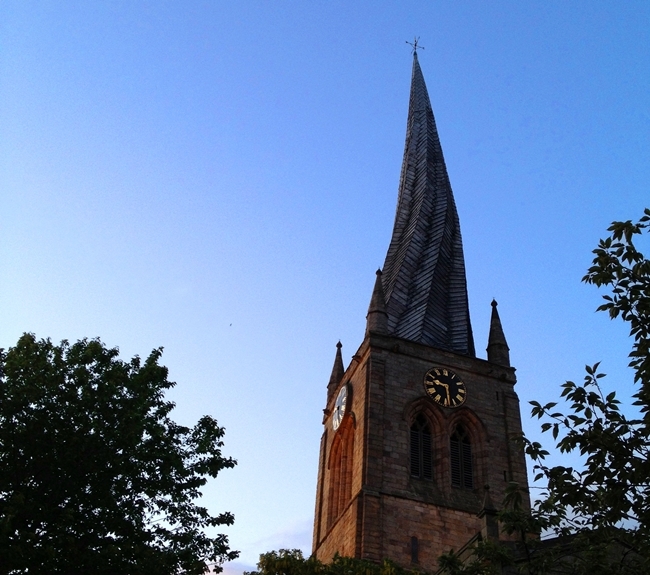 I started life off in a little market town called Chesterfield, a place very famous for a 14th century Crooked Spire! We lived in a three bedroomed semi-detached house across the road from my school to be, which was very handy! I had an attic bedroom which was my sanctuary. I remember picking my wallpaper; white with pink hearts! My mum gave up work to become a stay at home mum and my dad had a job as a long distance lorry driver. I was very lucky to have a Nanna and Grandad I adored and I had their full attention, as I was an only grandchild until I was seven. I remember receiving some lovely presents from them and I still treasure some of the things they bought me as a child.I spent a lot of time as a child with them, exploring the local area, going for walks and generally having fun. My dad was always doing jobs in the house. I used to come home from school and he would have knocked a wall down! But as soon as he had destroyed the wall he would build it back up again! We got used to living in brick dust and treading on nails! The town I live in is very near The Peak District. It is lovely to be able to say on impulse, 'let's go to Chatsworth today.' We are very lucky to have some beautiful halls around us and a castle down the road. There is always lots to do. I still live in Chesterfield, which goes back to at least Roman times, and it still has some very old buildings including an inn which dates back to the 12th century. I recently decided to do a post on being a tourist in my town and I found some really interesting facts that I didn't know. My daughters are eighteen and twenty and still live in Chesterfield too but they are ready to spread their wings! As part od the Blogging Everyday In May challenge, the first prompt was to tell everyone about us. If you want to learn a little more about me, you can click here. Thank you for taking the time to read my first post. I'm really looking forward to reading all yours. That crooked spire is awesome! Did they build it like that or is that time, age and weather's doing? White wallpaper with hearts is something I would still use now, sounds lovely! Thank you so much for your sweet comment on my post, I'm so excited about this challenge, it's my first one! The spire was built with unseasoned wood and three hundred years after it was built, lead tiles were placed on it which were just to heavy for it. This is what caused the twist. What an interesting spire! And that's a clever idea as well, playing tourist in your own town. Beautiful spire, so unique. It sounds like you had a lovely relationship with your grandparents growing up. How wonderful that you are so close to the Peak District (I grew up near the Yorkshire Dales), have you been to Dove Dale? I love it there, so beautiful. Ohh I am jealous of your part of the UK. I really must get out and about more and visit some of these lovely places and I finally learnt why the spire twists hurrah. Hope its sunny with you. Thanks for your lovely comment Kairen. I forget sometimes how lucky we are to be surrounded by such beauty. Your town sounds lovely! I love places with a lot of history - thanks for sharing that slice of your life with us. And thanks for stopping by my blog! It sounds like you had a great relationship with your grandparents! Some of my favorite memories are from the times I spent with mine as a child! Looking forward to reading the rest of your blogtember posts!! I've always thought attic bedrooms were quite magical. Thanks for sharing your story! Lovely to get to know you a little better; my older two sons are 21 and 18 so very similar ages to your daughters. I think Blogtember is a lovely idea and may well hop in. I always wanted an attic bedroom! It sounds like Chesterfield is a special place. Old things in Austin are about 150 years old or so. I envy you surrounded by such beautiful history. Nice to meet you via Blogtember. It's very easy to take it for granted when you see it all the time. This has reminded me how much history Chesterfield has actually got. My, my... what a blessing it must be to be surrounded by so much history! your little town sounds fantastic!! I can't imagine having a castle just down the road! I would love to have a room with white wallpaper and pink hearts! Feeling accomplished and meeting new people is the exact reason I chose to take part again. Glad to do you are doing the same. So jealous of your attic bedroom that was pink and white. That was always my dream. I got the pink part though. your area sounds amazing. i can't imagine living somewhere with that much history! i'm excited for the blog challenge, too. i hadn't found jenni's blog before the last time. Love the hot air balloon ride! These are all things I would love to do! That crooked spire looks beautiful! I would love to grow up in such a pretty place. I love reading about your family history. that's such a pretty place! i live between los angeles and orange county and they are so different architecturally. i typically don't like going to l.a because of the traffic and it's always cramped and dirty and it's just more urban, but the original buildings are amazing. orange county is all big spaces, clean lines, and big beige buildings that all look the same, but it kind of relies more on nature like the ocean and palm trees and generally uses a lot more plants and flowers as decor than the actual buildings. The ocean and palm trees sound divine. I love to see plants and flowers everywhere. They make places look so much better. Thank you for your lovely comment.